Ah, Fr. Martin. I miss you. This is more fun face to face, but blogging is an acceptable second. First, leave the Crusades out of this. They were a disaster - politically, militarily, and especially spiritually - and no reasonable Christian today would want to replicate them. They had many causes, few of them noble. At their heart, the Crusades were intended to take back the "Holy Land" from the "infidels." The mindset of Christendom (yes, I detest that term) during the Crusades was not one of free people defending themselves from vicious, wild-eyed conquerors. The Crusades were the expected result of two religions and cultures, each of which considered itself "true" in both spiritual and worldly manner. Besides, the Crusades are only a convenient straw man for your argument. The issue is religious toleration and its origins. It can be said, with little worry of contradiction,that the Church has not been in the vanguard of this movement. You say that Church and State have long been at odds. This was not because the Church wished for religious freedom and tolerance. It was because the Church wished to exert its influence over the State and mold it to the Church's design. It has been true of our Church, it was true of the Puritans, it has been true over and over again. It is a myth to try and paint the Church as in favor of religious toleration during any period before the mid twentieth century. Religious toleration had its origins in the Enlightenment, as a reaction against Papal authority. The United States was the first nation of note to enshrine the concept in law, and for a long time we really only meant it for Protestants. The Holy See was very wary of the American experiment for a long time, and didn't exactly move with haste to introduce the idea into its own territory. As you well know, Catholics such as John Courtney Murray were silenced and harrassed into the 1950's for daring to dialogue with Protestants. Religious freedom will come to Islamic countries when political concepts such as democracy take hold. The fault does not lie in Islam itself, but in its connection to the reactionary political systems of the Islamic world. No churches in Saudi Arabia? How many mosques in Christian-controlled Western Europe in the 1400's? Christianity has a 600 year head start on Islam. If we don't want to be judged by how we asted in 1405 (and I sure don't), then let's pull back on the whole "evil religion" thing. The peaceful Muslims of the West are the future of their faith. They have as much right to call their foem of their faith "true" as we do to call ourselves "true Christians" in opposition to the terrorists of northern Ireland or the Aryans of Idaho. I'm not saying that Islam and Christianity are equal. You well know that I don't beleive that. I am saying that the whole "There is no such thing as peaceful Islam" program smacks more of political than spiritual purpose, and is patently unfair in the light of history. I think it would be a mistake to term this "Islamofascism," as many neo-cons do. Fascism was about control of the state, per se. Islam is about control of one's conscience. Your posting successfully (in my opinion) points to the religious and historical roots of the problem. 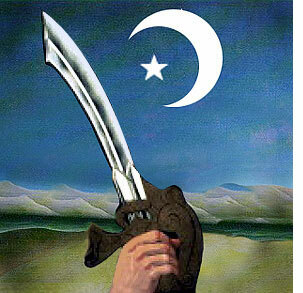 Islamic culture is not characterized by openness to outside ideas. Rather, it shares fearful insularity with modern day political correctness. It is like a house built on sand (as in Jesus' parable), but with the wrong materials and using the wrong plan. When the rains come, it tends to collapse. Knowing this, both Islamicists and many in the cultural left tend to react with vitriol and force to anything that questions the established wisdom, rather than engaging the issues. That's why Saudi Arabia could not abide the presence of a church. That's why China today cannot abide the presence of the Church. That's why Christmas is being purged of Christ. I agree with Mark Anthony this much: we're not talking about unmitigated evil when we speak of Islam. What we're talking about, in my humble opinion, is a religious heritage that is objectively dysfunctional. I am ready to admit that Christianity shares in dysfunction, and that other approaches to life, including so-called "secular humanism" are also dysfunctional. I think all of us would do well to look at our own traditions against objectively positive standards, if we can find such. I also think we will never find such standards if we rely solely on our own knowledge and understanding. Dialog is always necessary and indicated. The problem comes in establishing real dialog. I also think Fr. Martin's primary point was not about who is without fault, but rather who is more at fault and who remains primarily at fault. Mark, your comment doesn't address that, as far as I can tell. I'd say I'm making a couple of points, one subordinate to the other. My primary point is that the "peaceful, tolerant Islam" we're told is the main reality, is elusive. I'm all for it; but I strongly suspect there's a lot of wishful thinking and "projection"--if I'm misusing that psychological term--in these repeated assertions. I certainly hope Mark is right that we have reason to hope it will come, through natural development. I hope I am wrong in my negative assessment of Islam. But I am concerned that too many in our day lack the courage (I do not speak of anyone in this conversation) to say inpolitic, unpleasant things about Islam, and that could be a real problem. But the religious freedom we value today has roots in Christianity, as does the whole matrix of inalienable rights and limited government. No doubt, the so-called Enlightenment gets credit, and I won't deny it its due, but representative government has its roots long before the Enlightenment, as does the notion of law prevailing over human dictate. It's a long process of development. It's also true that Christendom, if I may run the risk of inexactitude in using that term, did impose its own dhimmitude on Jews and Muslims when it had the chance. But, based on my extremely limited understanding of the Koran, it seems to me there was a good deal less in Islamic tradition to give them an uneasy conscience about that, than there in in the Christian tradition to give Christians, in time, an uneasy conscience about the matter. Mark, you make many good points, but I think the example of northern Ireland and the Aryan "Christians" is a bit strained. "...representative government has its roots long before the Enlightenment..."
Indeed -- it predates Christianity! What I would have done better to point out is that, while the idea of the republic, and of democracy, came from pre-Christian Rome and Greece, what Christianity contributed was the insistence on universal human dignity, and an essential human equality; which, nonetheless, took quite awhile to emerge in law. But it was an essential joining, nonetheless. Thus, I'd "revise and extend" my prior remarks thusly.